I finished writing the latest book in the Emily Eyefinger series, Emily Eyefinger and the Secret from the Sea, a couple of months ago. It is now being edited by an excellent editor at HarperCollins, Australia. (Many thanks, Anne.) My first drafts can be messy but after a lot of re-writing I send off what I think is a "clean" manuscript. It's always deflating to get it back with scribbles all over it and pages of notes showing me where I've gone wrong. 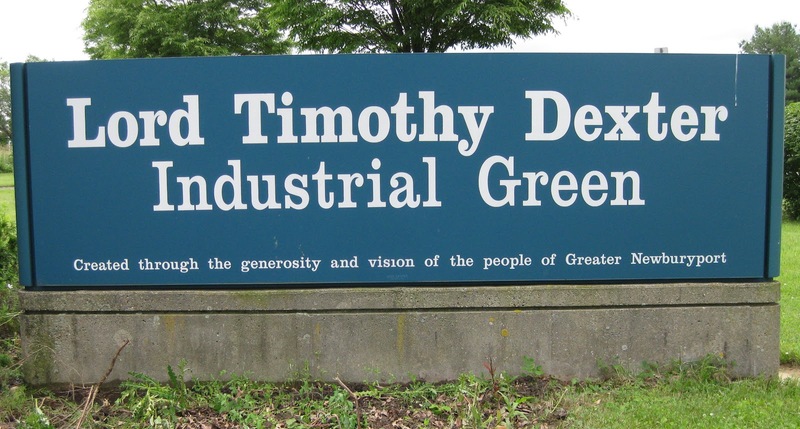 At times like these I think of Lord Timothy Dexter. (I wrote about him ages ago but you won't remember.) It's always heartening to be able to point to someone who is worse at something than you are or, in this case, than I am. Lord Timothy is my anti-role model. Or is he my role anti-model? Either way, he was a complete idiot. In 1798 he wrote and self-published a book with no punctuation at all and CapiTal lettErs UseD At raNdom. Well maybe not quite that random. He couldn't punctuate, he couldn't spell, his grammar was atrocious and he didn't have an editor to hide the fact. Or would that be facts? His book was called A Pickle for the Knowing Ones or Plain Truth in a Homespun Dress. It was a collection of his thoughts about everything. In it he declared himself, '...the first in the East, the first in the West, and the greatest philosopher in the Western World'. He was no shrinking violet. For those who complained about the lack of punctuation, in the second edition of the book, he included a page at the back with nothing but punctuation: rows of commas, exclamation marks, questions marks etc. He told his readers to 'peper and solt it as the plese'. Lord Timothy wasn't a lord at all. He was American for starters and America doesn't have a House of Lords. He just called himself "Lord". He was a businessman with a lot of luck. He bought a huge amount of Continental Dollars after the American Revolution when they were worthless only to have the new Secretary of the Treasury reinstate them as the real currency. Suddenly this worthless paper was real money and he was very rich. He used it to do lots of strange things including having statues of famous people made for his front garden. Of course he included a sculpture of himself. I have to declare an interest here: "Lord" Timothy was my father's mother's father's mother's father's mother's wife. Sadly I can't claim any of his DNA so can't use this as an excuse for the mistakes in my writing. My ancestor was Timothy's second wife and I'm descended not from him but from her marriage to her first husband, if that makes sense. One thing I will say for this highly eccentric man is that his book is in print after 214 years. There aren't many writers who could make that claim so he must have done something right. Today was Clean Up Australia Day and many thousands of volunteers around the country gave up a couple of hours of their time to make it a better, cleaner country. This is an annual event that began in Sydney in 1989 and has now spread around the country. Below is the Glebe, Sydney, NSW contingent who cleaned up Glebe's Sydney Harbour foreshore parks: Bicentennial Park, Federal Park, Jubilee Park, Pope Paul Reserve and Blackwattle Bay Park, which are really all one big park. Jeroen, was this year's organiser. He also organises his own monthly clean-up of the public spaces around Glebe. There is a program to regenerate the mangroves that once lined the Glebe foreshore. You can see it in its early stages to the right of the breakwater. An thinly-veiled excuse to show myself doing something useful. Flotsam is a problem. Litter from the land areas can be kept under control but every time the tide comes in the rubbish that's thrown off boats comes ashore. If you're a drinks producer you won't want to hear this but container deposit legislation would greatly reduce rubbish. South Australia and the Northern Territory are the only places in Australia with bottle deposit laws. We need a national law but there is strong lobbying against it. 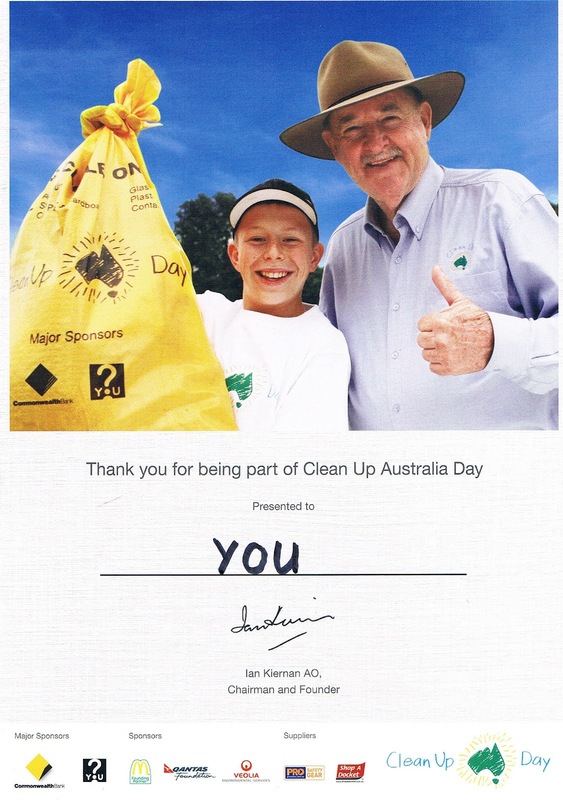 Two ecstatic members of Clean Up Australia Team Glebe showing off part of the haul. It is amazing what an impact some volunteers can make. So put it in your diary for next year and join the fun. You will feel suitably virtuous for ages afterwards---and guilty if you don't. Plus you'll get a certificate like this. How good is that? About a mile & a half from this place there is a view, exceedingly well worth visiting. Following down a little valley & its tiny rill of water, suddenly ... an immense gulf is seen at the depth of perhaps 1500 ft beneath one's feet. Walking a few yards farther, one stands on the brink of a great precipice. Below is the grand bay or gulf, for I know not what other name to give it, thickly covered with forest. The point of view is situated as it were at the head of the Bay, for the line of cliff diverges away on each side, showing headland, behind headland, as on a bold Sea coast. ... The class of view was to me quite novel & certainly magnificent. The route Darwin took is now named the Charles Darwin Walk and it leads to the top of Wentworth Falls, which even at the time of Darwin's visit, was already a popular tourist attraction. 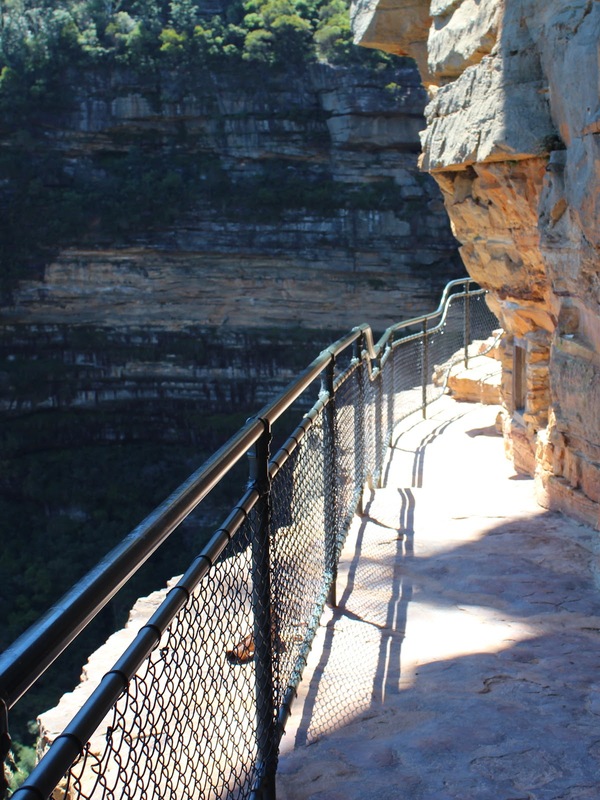 Back then you could only stand and look out over the Jamison Valley but now, thanks to the staff of the Blue Mountains National Park, and all the work they've done constructing walking paths, you can descend the "line of cliff" and walk along it. One thing hasn't changed from Darwin's time: the view over the Jamison Valley is still pristine. Last week my old friend and fellow author, Richard Tulloch, and I did one of our favourite walks at Wentworth Falls, The National Pass. Starting at the Conservation Hut Cafe at the other end of the escarpment from where Darwin was and, after fortifying ourselves with coffee and scones (with jam & cream) we started off down the track. 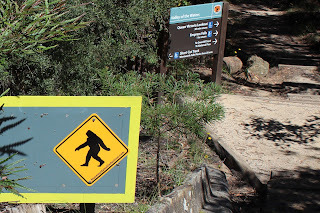 Ignoring the Yowie warning sign. 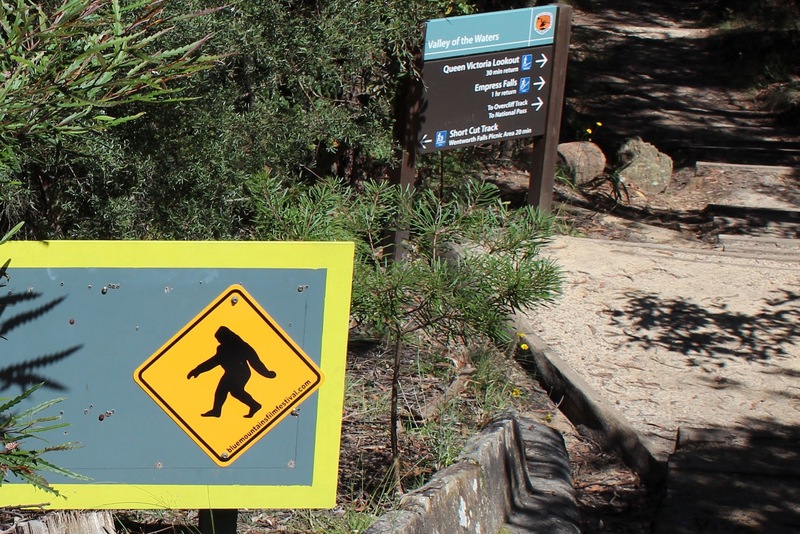 Yowies are Australia's answer to the Yeti and Bigfoot. Sadly, we didn't see one. It would have made for an interesting blog entry. Unfortunately Darwin didn't see one either as it would have given his book The Descent of Man that little magic something to keep it in the charts a bit longer. In any event these men descended to Lodore Falls, Sylvia Falls and Empress Falls on the Valley of the Waters Creek. A group of canyoners were busy canyoning down the creek. We stopped to watch just long enough to be happy to be warm, dry and on foot. The National Pass track traverses the middle of the cliff from the western (Conservation Hut) end to the eastern, Wentworth Falls end. Or the other way around depending on where you've parked. I've drawn a red line on the photo above to show were it goes. If this looks scary, it's really not. The track is well-maintained and the National Park people have made every effort to keep people from unnecessarily plummeting to their deaths. I guess it's in their interests, too. It was a warm day but, considering it's summer here, we were just pleased that we weren't walking in blistering heat. But it is a well-shaded walk and it's been so rainy recently that there was always a bit of cooling spray from above. A few stretches are better for kids---short ones---than adults. Okay so now you wish you were bushwalking instead of staring at a computer screen. You can get to the Blue Mountains from Sydney by car, bus or train and there's all the information you need at the various Park information centres---such as the one in Springwood on the Great Western Highway on the way to Wentworth Falls. There are also excellent guide books. My favourite so far is Blue Mountains Best Bushwalks by Veechi Stuart. For those of you from away, Sydney is just a short plane ride. Just hop on the plane, go to sleep for a day or so and you're here. The track has wonderful views out over the valley but, equally interesting, is the variety of plant life on the cliff face. There are a number of plants that grow only the wet rock faces in the Blue Mountains and nowhere else in the world. If I knew anything about plants I'd have included a photo of one. At the other end of the track we arrived at Wentworth Falls. It's a good climb up but there are stretches of metal stairs that make it easy. This is part is a popular walk so it can be a bit of a conga line on weekends. Once on top of the Falls the trip was only half over. From here we again traversed the cliff line on the Overcliff Track back to the Conservation Hut Cafe and rewarded ourselves for our efforts with a filling lunch. Back to Charles Darwin's brief trip to Oz: he wasn't as excited by the fauna here as he had been in the Galapagos because so much of it had already been described. He didn't see a yowie but on his trip to the Blue Mountains he came across other animals that puzzled him. He saw a rat-kangaroo that seemed to fulfil the same function a rabbit does in England. And he saw a platypus that was much like an English water vole. But both were very different in anatomy. In his diary he wondered who one creator would have designed different animals to fill similar ecological niches in different parts of the world. It wasn't an original thought but Darwin eventually pursued it in a way that on one else did. Using this and other evidence he collected on his voyage he wrote a book with the catchy title, On the Origin of Species by Means of Natural Selection, or the Preservation of Favoured Races in the Struggle for Life. We know it simply as On the Origin of Species. So there you have it: if it hadn't been for a tourist visiting the Blue Mountains years ago we would never have had the Theory of Evolution. QED.